We were discussing “Rankine cycle in a thermal power plant” and also “difference between Rankine cycle and Carnot cycle” in our previous post. We have discussed there the basic concept of ideal Rankine cycle and also we have seen the difference between actual Rankine cycle and ideal Rankine cycle. Today we will see here the concept of reheat cycle in steam power plant with the help of this post. We will also see here that whether efficiency of steam power plant will increase or not with reheat cycle. When we need to limit the quality of steam to 0.85 at the exhaust of turbine, we will apply the fundamentals of reheat cycle. Let us see first the basic arrangement of components and respective T-S diagram of reheat cycle used in steam power plant. 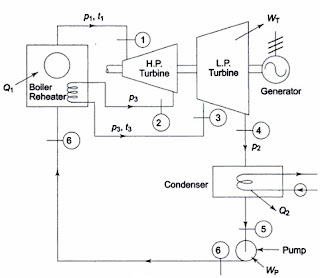 As shown in figure above, steam will not go for complete expansion up to the condenser pressure directly but also all the steam will go for partial expansion in the turbine up to an intermediate pressure and after that steam will enter to the boiler, where steam will be reheated at constant intermediate pressure and after that steam will go for expansion up to condenser pressure. We can also say that in reheat cycle, steam will go for expansion from starting state 1 to the condenser pressure in two or more than two steps depending on the numbers of reheats used. Now let us see the figure above, steam will enter to the high pressure turbine at temperature T1 and pressure P1 at state 1. Steam will undergo here for partial expansion up to an intermediate pressure P3 and this process of partial expansion of steam in high pressure turbine is displayed in figure by process 1-2. Condition of steam at state 2 might be dry saturated vapour state or superheated state depending upon the value of intermediate pressure P3. 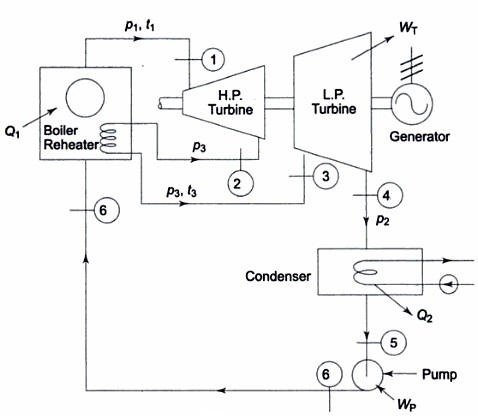 Now steam will enter in to the reheater at state 2 and reheater, as shown in figure, will use the heat energy from boiler for reheating the steam coming from high pressure turbine. 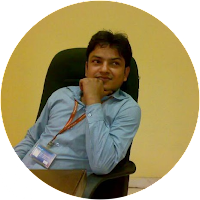 In simple way we can say that steam will be reheated in reheater coil tube by receiving heat energy from boiler. Steam will be heated in reheater up to a temperature of T3 as displayed in figure by process 2-3. Steam will enter now to the low pressure turbine at temperature T3 and pressure P3 at state 3 and will undergo for expansion in the low pressure turbine up to condenser pressure P2 as displayed in above figure by the process 3-4. Rest processes are already discussed during the discussion of basic concept of Rankine cycle i.e. steam coming out from low pressure turbine will enter to the condenser at state 4 and undergo for condensation process 4-5. Working fluid coming out from the condenser will be pressurized by feed pump during the process 5-6 as displayed in above figure. Now we must have to note it down here that working fluid will be heated in reheat cycle in two steps i.e. heating of working fluid at constant pressure P1 during the process 6-1 and this is the first step and second step i.e. 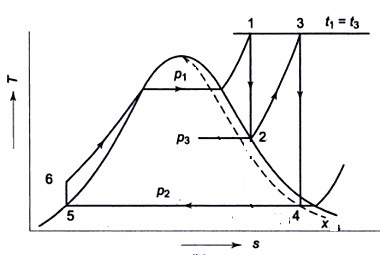 heating of working fluid at constant intermediate pressure P3 during the process 2-3. 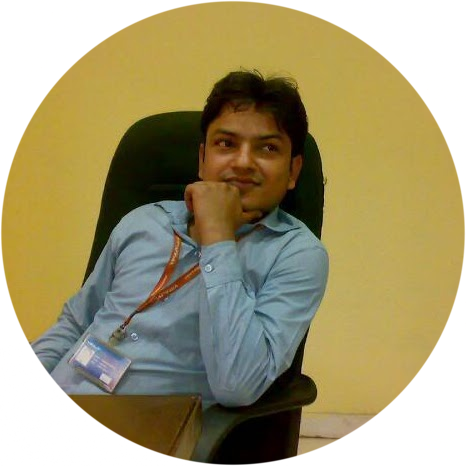 If someone asks that whether efficiency of steam power plant will be increased or not with reheat cycle, we can’t answer because efficiency of reheat cycle will be dependent here over the mean temperature of heat addition and also over the working condition too.